If you haven't heard of it, Pillars of Eternity is a game that was Kicktarted as "Project Eternity" a while back, and has recently released. 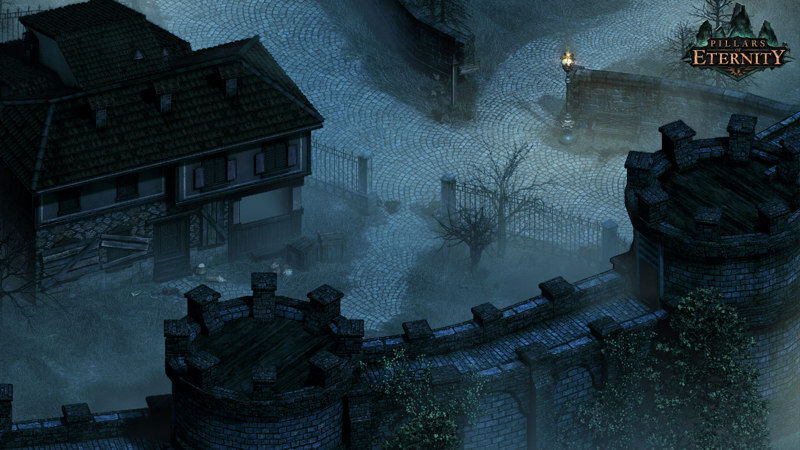 If you remember playing old BioWare titles in the Infinity Engine, like Baldur's Gate, Icewind Dale, or Planescape: Torment, Pillars seeks to channel your nostalgia for those games. For me, at least, it works to great effect. Pillars uses the old BioWare Infinity-style isometric camera, and the backgrounds are 2D paintings with 3D effects bringing them to life. The result is often pleasant, sometimes breathtaking. The mechanics, too, seem to be trying to emulate what you remember those old games being like, rather than what they actually were like. Again, they succeed with great aplomb. But the story. The story is where they succeeded with the most flair, at least for me so far. The quests are deep and engaging, and are rarely as simple as they seem on the surface. What seems like a simple delivery quest might turn into a foray into mercantile intrigue, complete with moral choices, making enemies, and even gaining a new party member. You never really know what you're getting when you decide to help someone in Pillars, and motives are often unclear. The dialog enhances this and, though only about 25% of it is voiced, the prose in Pillars is well-written and engaging, enough so that, after 37 hours of reading it, I want to know more about the world, the characters, the political intrigue, the monsters, and the curse known as Waidwen's Legacy. Oh, and here's the other thing: I'm 37 hours into the game and I don't really see an end in sight. Not only that, but I haven't really experienced any of what I'd call "filler content". Every quest has been interesting and has featured unexpected twists. Every conversation, no matter how trivial, has been entertaining enough to keep me reading it. Is Pillars of Eternity a perfect game? No. But it is a significant accomplishment.